In the 1970s, disillusioned by academic medicine and a salary discrimination against Black academic staff, she entered private practice as a specialist pathologist. However, in 1978 she was invited to apply for the chair of anatomical pathology at the University of Natal. A pioneering woman, Professor Kallichurum broke down barriers to succeed in a world that had long been considered a male stronghold. She lectured in the Department of Anatomical Pathology and was appointed as the first women Professor and Head of the Department. She was appointed Natal University’s first women (and Black) Dean of its Medical Faculty in 1984 in which position she served for several periods, first in a part time capacity from 1984 to 1986 until she was appointed to this post on a full time basis. The history of the Natal University Medical School in the Apartheid 1980s was one of turmoil. A discontented student body frequently boycotted classes over various grievances, such as the discriminatory practices in medicine. Also, the university’s governing body had treated the medical school since its inception as a “Cinderella” faculty and the senate and council were not interested in the difficulties that staff and students had to face from working in appalling conditions. One of Professor Kallichurum’s greatest attributes was her negotiating ability, and she used this to full effect during this difficult time, liaising with medical students, staff, and the university governing body. She became known for her fearless protection of students when the university authorities or the security services cracked down. Students also nick-named her “the granite woman” because her approach to problems was at times unemotional. 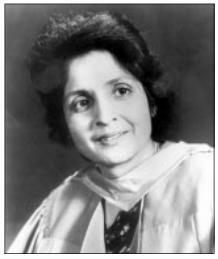 She was an icon at the medical school. She was a strict disciplinarian who demanded high ethical standards, but she was also a role model to all academics, particularly to women, who had to work in an environment that was full of discrimination. Professor Kallichurum retired as professor of anatomical pathology in 1994. From 1994 to 1997, she was President of the Interim Medical and Dental Council of South Africa and then, from 1998 to 2002, of the transformed body, the Health Professions Council of South Africa. She was highly motivated in approaching the important task of transforming the previously White oriented South African Medical and Dental Council into a Health Professions Council that is representative of the demography of the country and of all the disciplines of health care. Professor Kallichurum was the first woman to be appointed President of the Health Professional Council of South Africa (HPCSA). She served on the University of Natal Senate, the Senate Executive and the Senate Council, was a member of the Provincial Public Service in KwaZulu-Natal and chairperson of the Department of Health Task Team on the establishment of National Health Laboratory Services in South Africa. She was also a member of the Commission of Inquiry into the Gauteng Public Hospital Services. She is also a member of the Department of Health’s Steering Committee on post-graduate medical education. Professor Soromini Kallichurum was an internationally respected pathologist and an authority on lung diseases in the Black population and is considered a South African medical icon and a fearless protector of students during apartheid. She was a role model to a generation of South African students and academics. Professor Soromini Kallichurum is predeceased by her husband Karoon Rughubar. She passed away on 21 December 2002. She is survived by three daughters and her grandchildren.